Mars Opposition (火星大冲 in Chinese) for 2012 occurs on Sunday 4th of March at 4:04 am Singapore time. Mars opposition means Earth is in the middle between the Sun and Mars as shown in the following diagram. This implies Mars is on the opposite side of the Sun as viewed from Earth. Thus, on this day, when the Sun sets in the west, Mars will rise from the east. And Mars should be visible in the sky for almost the whole night till next sunrise. The significance of opposition for scientist is that because of its closer distance and bigger apparent size in the sky, more detailed observations can be made. When this timing is taken into consideration in advance when planing spaceflights to the planet, more fuel and time can be save. For amateur astronomers and stargazers, due to its close proximity and bigger apparent size, it presents the best opportunity to observe the planet visually and take photographs or video of it. The moons of Mars will also look brighter and easier to spot through a telescope due to this reason. For this coming Mars opposition, you do not need to only wait for the precise 4.04 am timing to observe it. You can start to observe Mars few days before and after 4th of March as the changes in the apparent size and brightness of Mars is not very drastic. During this period, the size of Mars as viewed from Earth will be 13.9 arc seconds at a brightness of -1.3 (the smaller this number, the brighter it represents). The Moon is 1800 arc seconds. So now you now the Mars does not grow bigger than the Moon during opposition, or any planet for that matter. During the 2003 Mars opposition, its maximum size was 25 seconds and maximum brightness at -2.8 magnitude! Almost double of this year's upcoming opposition. The following is an illustration of its relative sizes during oppositions over the years taken by the Hubble Space Telescope. The 1997's diagram represents about 14.2 arc seconds which is quite close to 2012's 13.9 arc seconds. So you can use that as a visual comparison. Mars opposition happens approximately every 2 years. So if you miss this, you will have to wait till 2014. 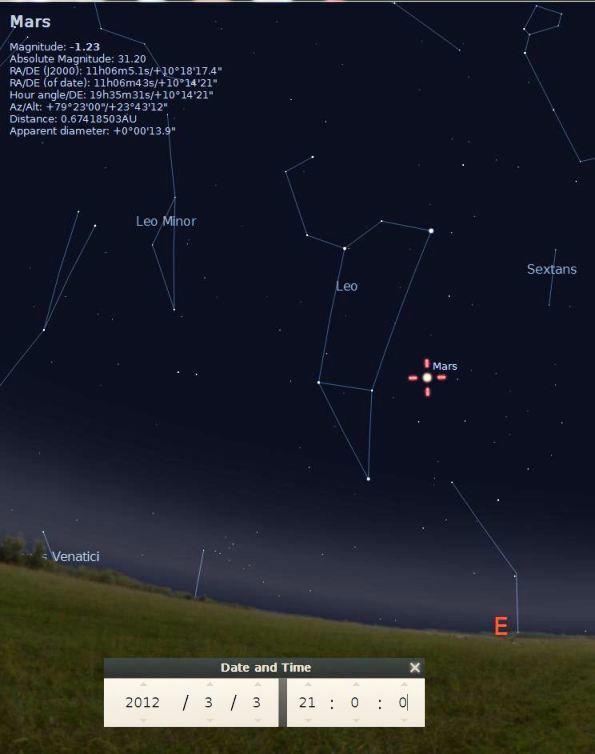 To find Mars in the sky, look towards East and the brightest red star-like object you can see will be Mars. At about 9:00 pm during this weekend, it should be around 23 degrees above the horizon as shown in the following diagram. Mars is currently in the constellation Leo the Lion. To further confirm what you are seeing is Mars, look for a bunch of relatively bright stars to the left of Mars which form the constellation Leo. There are not much bright stars to its right when Mars is rising in the East. To see some features of Mars, a binocular may not be sufficiently powerful. You need to see it through a telescope. Admission: Free and open to public. You may bring along your telescope if you wish to. In addition to observing Mars, we will be observing other celestial highlights of the night like Moon, Jupiter, Venus, Seven Sister and Hyades star clusters and Orion Nebula and many more depending on the quality of the clear sky. So do come and join us with your family and friends and enjoy a fun-filled evening under the stars! This is the one-take video of the International Space Station (ISS) flyby on 6 Feb 2012 captured right here at Toa Payoh Central. According to wikipeida, the ISS is a habitatable artificial satellite in low Earth orbit and can be seen from Earth with the naked eyes (!). Watch this video to understand what is the ISS and what it represents. This will enhance your appreciation of ISS the next time you see it in the sky and not just some small white dot drifting across the sky. The first time I saw it in early 2011 was due to pure luck and I wasn't even looking for it in the first place. I had just taken a toilet break and walked pass my kitchen when I decided to take a quick peek out of the window to check if the sky condition. And there it was. A white bright moving object cutting across the Canis Major constellation. As I have not seen it before or expecting to see it so suddenly, the first split-second thought was "UFO!" immediately followed by "don't be ridiculous!" then "OMG ISS!" and then "call someone now to take a look!". By the time I realise it was most probably ISS and observed its rate of movement, I knew it will be too late to call anyone. Later went online to confirm it was indeed ISS. Armed with some knowledge and online resources to track satellites, I was looking forward to seeing ISS again. The second time I made an attempt was with Zong at Toa Payoh Central during one of our sidewalk astronomy sessions. He has not seen it before and was quite eager to see it after I told him about the toilet break story. He brought his 7x50 binocular along and I was quite excited to see ISS through it. When the ISS transit time was near, we started to look up at the predicted direction. After a while, we felt the neck strain and came up with a strategy. One will look up while the other rest his neck and then take turns. Later we just laid down on the big granite seat and look up. We waited and waited and still no signs of ISS. Must be the high clouds blocking it that evening. Bummer! A few weeks later, there was another predicted bright ISS flyby over Singapore. But it was late in the afternoon (around 5 - 6 pm) when the sky should be still quite bright. Highly unlikely to see it even if the sky is clear. In anycase, during the transit period, I was walking back home from the MRT station along the Ya Kun Kaya Toast stretch. Sky was clear and blue so decided to look up towards the northeast for ISS. There it was! Bright enough to be seen against a blue sky! Instinctly pull out my handphone and quickly looked down at it to hit the camera app icon. But wait, need to key in the password pattern first! Quickly looked up and sure enough as expected, ISS was gone as it went behind the building. Total observing time -- 2 seconds! LOL. But it was a great lesson not to not expect ISS showing up against that kind of blue sky when it was at that magnitude of brightness and more importantly, planning way ahead (e.g. unlock the damn phone, select video mode and wait BEFORE the flyby). A few weeks later sometime in July 2011, the Space Shuttle Atlantis docks with ISS for the last time. Thanks to Gavin's post in the singastro forum about this event, I was aware of another bright ISS flyby. That night I decided to go the darker Toa Payoh Town park to test out one of my telescope away from the usual crowd and then join Zong later for a sidewalk session near the library. There was a passerby who was quite interested to look through the telescope and I was glad to let him have a peek. Zong later decided to come to the park and meet me first as I told him there was a potential ISS flyby and we may be lucky this time. He might not have come to park that evening as his original plan was to go the library to return some books and wait for me there. And there it was! Looks even brighter because of the darker environment of the park. This time it was "flying" almost a full arc across the sky! Me and Zong was like woohoo-ing like crazy when we saw it. And I think I was waving my arms and yelled something childish like "HELLO ATLANTIS!!!!!" or something to that effect. The by-stander must be shocked by our reactions but I wondered if he realised how lucky it was for him to see it and have someone nearby to explain to him the historical moment - the last shuttle in space docked with ISS transiting the sky. Best view of ISS for Zong and me that evening. I did not even bother to video it and just wanted to fully immerse myself in that naked-eye visual experience. Just like how I felt when I saw Jupiter and Moon through my first telescope, I must find a way to let more people enjoy such wonderful moments in the future. This amazing video shows how it looks like when a space shuttle docks with ISS. Inspired by that exhilarating experience, I tried to research more about viewing and imaging the ISS through a telescope. One of the low-cost solution was to use a telrad finder together with a webcam. Position the telrad aiming rings just infront of the moving ISS, let it drift pass and capture some video frames and keep repeating the whole process throughout the ISS flyby. The telrad finder makes a lot sense as the parallax error was very low and you can open both eyes and track ISS without the need to constantly look down at anything else. A few week later I was doing another sidewalk way past midnight and was talking astro to a bystander and a fast-food restaurant employee who was taking a short break. I had my 8-inch telescope setup with a rigel quikfinder which has a greater parallax error but was more portable due to its smaller size. While I was talking to them, the bystander saw something moving behind my back and asked me what it was. I was mentally preparing to turn around and take look and then explain to him it was most probably an aeroplane or some optical illusion. And there it was again! ISS !! Again, I was caught off guard. But the scope's optics has already cooled down nicely after hours of sidewalk and was pointed toward the path of the flyby. My widest field eyepiece was attached and the rigel quikfinder was still switched on which means there was only one thing left for me to do -- apply knowledge! As I was quickly explaining to them what it was, I aimed the finder infront of its predicted path and look through the eyepiece. I knew from my previous research it will be too late to focus the ISS now so I did not bother and just try to observe as much as detail as possible through the eyepiece. When the ISS drift pass the field of view, I can still make out the outline of it. What a thrill. No longer just a dot of light. I have seen much better video-recorded views of it but nothing beats seeing it live for the first time. Fast forward to 2012, read one of the singastro forum post was about viewing of satellites. It reminded me of such fun experience with ISS as mentioned above. I have since gathered a very tiny twitter following since I started blogging and have also started posting astronomical content at the popular hardwarezone forum. Just like sidewalk astronomy itself where we bring the telescope to the public, amateur astronomers should not only consider engaging potential newcomers only when them come to visit the astronomy forums. There will always be netizens who are or may be interested in astronomy but due to comfort reasons, still prefer to hang out online in their non-astronomy specific forums where their friends hang out too. So reaching out to them via other forums and social media is important and fun too. So I decided to kick start a small experiment to get others excited about observing satellites. On the first week of February, I did a quick check on heavens-above.com and saw a potential bright ISS flyby on 6 of February. Magnitude -3.1, maximum altitude 45 degrees and at a convienent observing time shortly before 8pm.. Good candidate. As usual, twittered and posted in the singastro and hardwarezone forum about this flyby on Feb 6 afternoon. Base on past experiences, I was expecting several misses before we can really get to see a good flyby. I was already preparing for dates and timings after 6 Feb. I was outside during the afternoon and half of the sky was cloudy. In the late afternoon on my way back home, a good astro friend whatsapp'ed me how the sky looked like from his place - lots of black clouds rolling. Looks like another bummer in the making. On my way back home, I suddenly realised why all this while I was thinking of videoing the ISS with my lousy phone camera when I actually have decent camcorder lying around at home? Will be great if I can capture the ISS on my camcorder and share it with the public. But he dark clouds were saying to me "don't bother, not tonight". Reached home at around 7.15 pm. The eastern sky still have some small patches of blue hazy sky where the Moon was visibly. But dark clouds covered the western sky and threatening to engulf the whole sky very soon. So there I was again, staring outside the same kitchen window where I first saw the ISS and waiting for the sky to get darker and turn totally cloudy very soon. A little pessimism sets in. So what even if the sky is clear? My camcorder may not be sensitive enough to capture the ISS. Tick tock tick tock. The dark clouds somehow stayed stationary in the west. Sirius getting brighter and brighter in the southeast. Wait. Sirius. If my camcorder managed to capture it during the last december recce video for the total lunar eclipse event at the Toa Payoh Central Community Club, why would it not be able to capture ISS at mag -3.1 if the sky is clear?? Time is 7.35 pm. What the heck. What is the worst that can happen? It is only a 10-minutes walk from my house to the library. Quickly grabbed my camcorder and did a quick march to the planned observation site in record time. When I reach there, the sky was clear and rest is history as seen in the video. (1) This is our favourite sidewalk astronomy location in Toa Payoh. A video proof of ISS visible there will add further interest and build momentum to this regular observation site, similar to the planning of the total lunar eclipse event there last december. (2) Delibrate decision not to choose a more scenic location in order to create a stunning and thought-provoking contrast. That observation site is one the few public places in Toa Payoh with an open sky but yet is one of the most light polluted. But still, the brightest stars, planets and ISS are still visible on a clear night. How many more wonders of the night sky can we see if the light pollution there can be reduced? (3) Towards the end of the video, I wanted to show the public being totally unaware of the spectacular sight that just flew over their heads. Not a single person looked up. Not a single person asked me what I was trying to film (perhaps they just conveniently assume I was just trying to film the bright clear moon). How many wonderful sights have we missed in our busy lives if only we are slightly more astronomical aware and curious and look up more frequently? (4) To appreciate and marvel at the technological and scientific achievement of mankind as shown in the precise accurate predictions of such flybys. (5) Zooming in and out of the video in one-take to prove the authenticity of the flyby. (6) Original audio with no music added. To prove how silent the flyby is compared to a rumbling engine noise of commerical jet. And also the crowd's reaction or in this case non-reaction to the flyby. (7) To encourage others to observe, video, photography and share such satellite flybys experiences in the future. You don't need expensive equipment to do so. The greatest satisfaction I get out of this event is knowing that a few others saw it for themselves too because of the little awareness of this event that was created. Reading and listening to description of such feedbacks really made my day. For example, one of them need to dash from one room of the house to another in order to continue observing the flyby as long and as unobstructed as possible! Another was so pleasantly shocked to see it that he had momentarily forgotten there is a video recording function in his handphone and only took photos. I hope you guys will remember 6 Feb 2012, the last day of the chinese new year celebrations, for a very long time!